Greeting from Montego Bay, Jamaica! 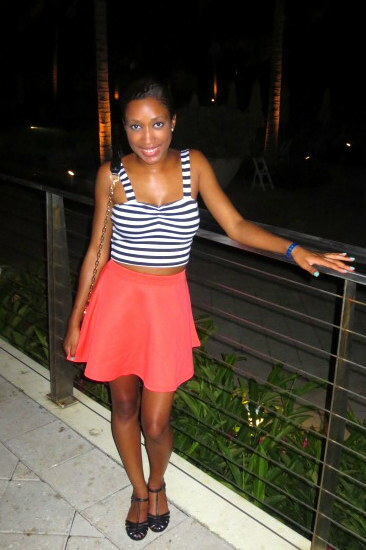 Last night I kept it pretty simple with a striped crop top and coral skater skirt. I wore my comfy new t-strap Dolce Vita flats and my chain Tory Burch bag to complete the look. I do not get much use out of the Tory Burch bag usually because of the size, but this is the perfect size for a vacation. Check out the details of my look below! Hope everyone had a great Saturday! Look out for Day 2 of my Island Style Diary tomorrow! Awesome! I just got back from Jamaica last night. We stayed in Ochos Rios I wish I could have stayed forever!